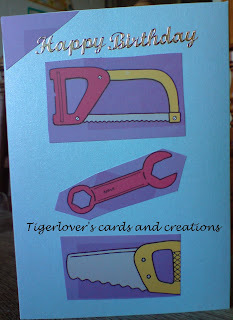 Tigerlover's cards and creations: Birthday card for my dad. I have just made 2 cards yesterday. The first one is a birthday card for my dad, who will have his birthday on Wednesday and the second one is to be revealed on Thursday as it is my DT entry for the 3rd C.R.A.F.T. Challenge later this week. For this card I used some backing paper I won some time ago from Jasmines cards with my Easter card. I thought it would be just right for my dad, even if he does not do a lot of DIY. I hope you like the card. Any comments are welcome and very much appreciated. Thank you for looking and I hope you will all join us again at the C.R.A.F.T. Challenge. 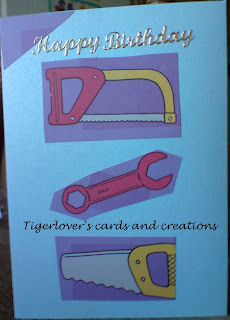 I'm sure he'll love your card, Little Tiger.